A new paper published in Nature Geoscience finds global marine clouds exert a negative feedback cooling effect on Earth's surface temperatures. However, all current IPCC models adopt net positive feedbacks for water vapor and clouds, and this false assumption may account for a large portion of the exaggerated warming models project (in addition to the climate being less sensitive to CO2 than the IPCC assumes). "a 6% increase in the albedo of global marine stratiform clouds could offset the warming that would result from a doubling of atmospheric CO2 concentrations" i.e. just clouds over the oceans alone, not considering clouds over land. "The most obvious way for warming to be caused naturally is for small, natural fluctuations in the circulation patterns of the atmosphere and ocean to result in a 1% or 2% decrease in global cloud cover. Clouds are the Earth’s sunshade, and if cloud cover changes for any reason, you have global warming — or global cooling." 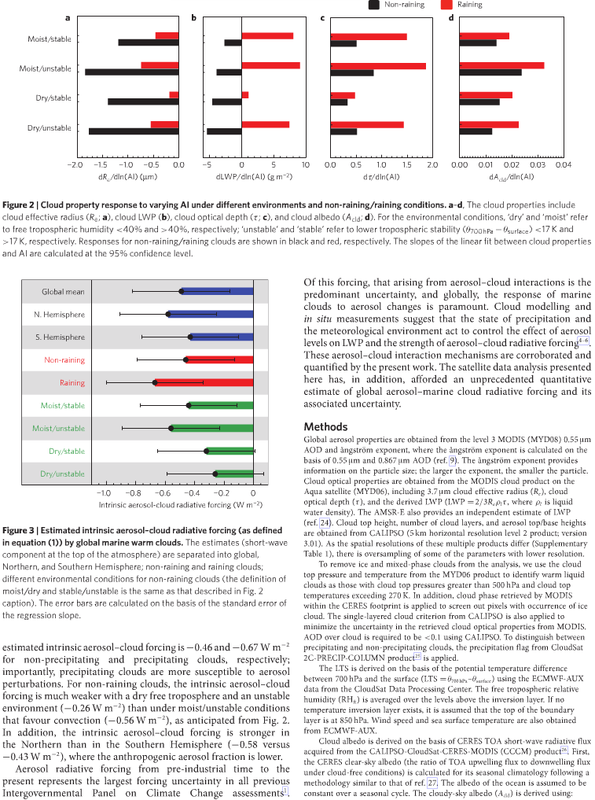 "The estimated intrinsic [marine cloud] forcing is −0.49 ± 0.33 Wm−2, and for the extrinsic (cloud-cover effect) forcing, we estimate −0.46 ± 0.31 Wm−2" "We have also estimated the long-wave component of aerosol–cloud radiative forcing (Supplementary Information); the estimated long-wave TOA [Top Of Atmosphere] intrinsic and extrinsic forcings are −0.01 and 0.09 W m−2, respectively." Adding the 4 forcings obtains a net shortwave and longwave marine cloud forcing of negative 0.87 Wm-2, higher than many climate sensitivity estimates for a doubling of CO2 levels. forcings are −0.01 and 0.09 W m−2, respectively. Changes in aerosol concentrations affect cloud albedo and Earth’s radiative balance1. 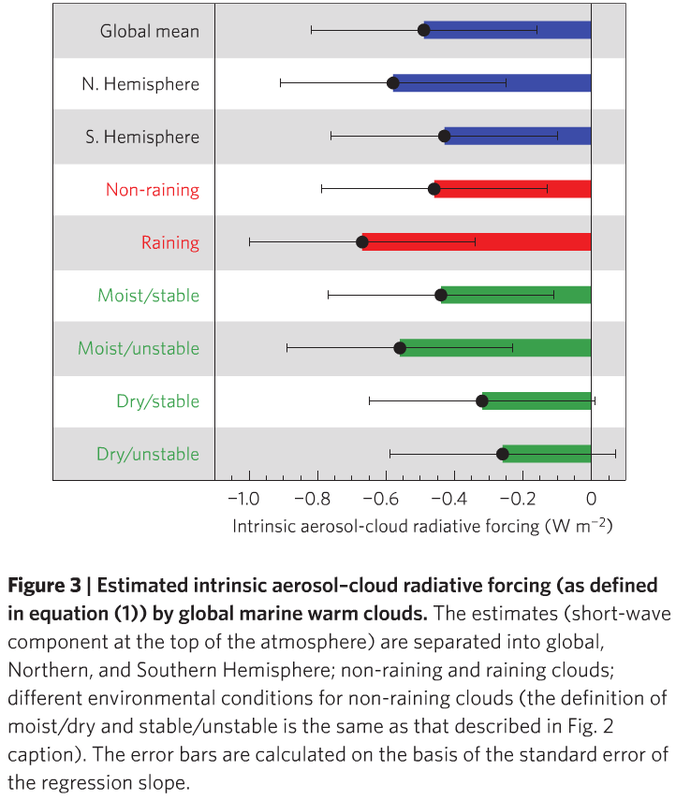 Aerosol radiative forcing from pre-industrial time to the present due to the effect of atmospheric aerosol levels on the micro- and macrophysics of clouds bears the largest uncertainty among external influences on climate change1. Of all cloud forms, low-level marine clouds exert the largest impact on the planet’s albedo2. For example, a 6% increase in the albedo of global marine stratiform clouds could offset the warming that would result from a doubling of atmospheric CO2 concentrations3. Marine warm cloud properties are thought to depend on aerosol levels and large-scale dynamic or thermodynamic states4, 5, 6. 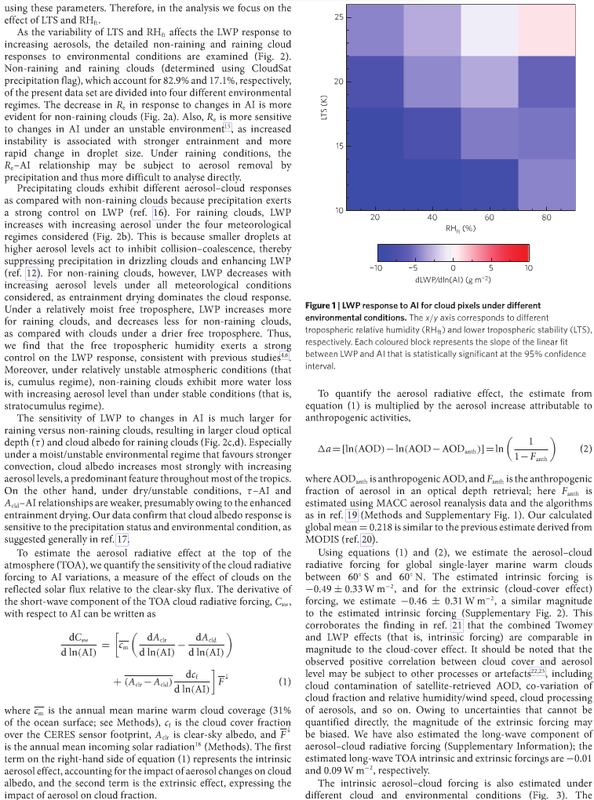 Here we present a comprehensive analysis of multiple measurements from the A-Train constellation of Earth-observing satellites, to quantify the radiative forcing exerted by aerosols interacting with marine clouds. Specifically, we analyse observations of co-located aerosols and clouds over the world’s oceans for the period August 2006–April 2011, comprising over 7.3 million CloudSat single-layer marine warm cloud pixels. We find that thermodynamic conditions—that is, tropospheric stability and humidity in the free troposphere—and the state of precipitation act together to govern the cloud liquid water responses to the presence of aerosols and the strength of aerosol–cloud radiative forcing.